Chelonia mydas, commonly known as Green Sea Turtles are quite abundant in warm Hawaiian waters and the Hawaiian name for them is honu. It's quite common to see honu swimming in the surf off the rocky shores and beaches of Kauai as they feed on sea grasses below the surface. Sea turtles are found throughout the oceans of the world and all species are threatened or endangered. In 1978, the Hawaiian population of the green turtle (a separate subpopulation) was listed as threatened under the U.S. Endangered Species Act of 1973. It is illegal to harm, collect or capture them. 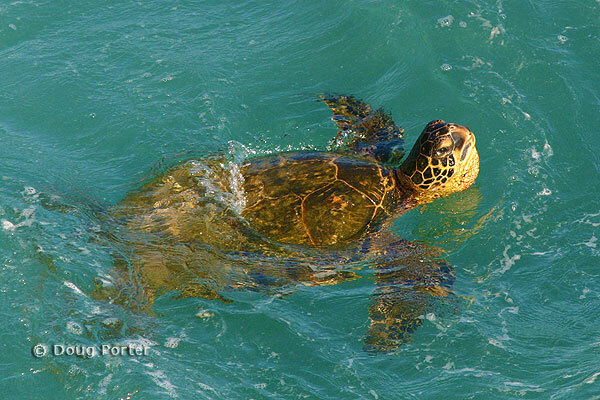 Spotting honu in the water is easy, having your camera ready to get a shot of one when they come up for air is harder. This picture was taken from the lanai of a condo at Kuhio Shores near Poipu Beach. Poipu Shores is another excellent place to see them and maybe get a picture if you're lucky. The bay next to Kuhio Shores is an excellent place for snorkeling with these interesting sea creatures.